Before there was molecular gastronomy, there was Baked Alaska to awe and delight a table of diners. A miracle dessert of warm, caramelized meringue on the outside, still magically full of layers of frozen ice cream on the inside. A feat of culinary ingenuity in the days of unreliable refrigeration. The story goes that Baked Alaska was created in New York's famous Delmonico's restaurant in 1867 in celebration of the American acquisition of Alaska from Russia. 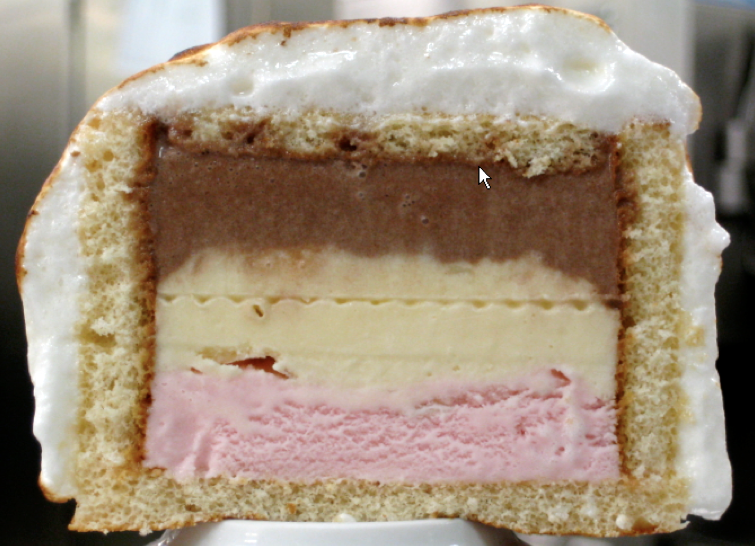 Regardless of its origin, creating Baked Alaska back in the day was only for the fearless. The elements are not complicated - it's cake and ice cream and meringue, all within reach of even a moderately good chef. But the trick is in the execution. Get the temperatures wrong and you had a plate of dripping, soggy mess. So a good chef – and access to reliable refrigeration – were key to a triumphant Baked Alaska. The dessert, in single or multiple servings, resembling a snow-topped Alaskan mountain, became almost a status symbol and a classic showstopper of a dessert. Cruise lines got into the spirit when modern refrigeration was installed on ocean liners and Baked Alaska became the celebratory peak of cruise dining, with Baked Alaska 'parades': a procession of dining room staff each bearing a flaming Baked Alaska for each table of diners to top off an evening of formal dining. (Hilariously, often to the unofficial Baked Alaska parade theme song of 'Hot, Hot, Hot'). Baked Alaska is rarely seen in restaurants nowadays… but lives on in cruise culture. Where better than a cruise to Alaska to learn how to make this classic – and classic cruising – dish? Regent Seven Seas Mariner's pastry chef showed BestTrip.TV his tips and tricks to perfect Baked Alaska… and shared his recipe here for you.